New year’s greetings from the Graduate College! As I reflect on the six months that I’ve been serving as Acting Dean of the Graduate College, I feel so much gratitude for the many people who have helped me in this position. It is such a privilege for me to work with the staff of the Graduate College. Each is an expert in her/his particular area of the graduate enterprise. You may have heard that we have had some changes in staff recently. First and foremost, Dr. Susan Stapleton is serving as Interim Provost and Vice President for Academic Affairs, which is why I am in the acting dean role. Angie Phelps, our former budget analyst, has moved down south to Florida to escape the Michigan winters. Virginia Bryan, our program manager of graduate appointments, retired from WMU after 36 years (!) at the university. Linda Comrie, Executive Assistant to the Dean, will be retiring at the end of this month, and while I can’t imagine the office without her cheerful attitude, professionalism, extremely capable skills, and caring nature, she deserves some rest after 19 years of service to the Graduate College. As sad as it is to lose our respected colleagues and friends, this is an opportunity to welcome some new faces in the office. Elena Wood is our new budget analyst and Joanne Beverage is our new program manager, graduate appointments. Both bring years of valuable WMU experience and many key skills to the Graduate College. We are currently performing a search for a new executive assistant, and I am confident we will find an amazing new colleague. Best wishes for a happy and healthy 2018. 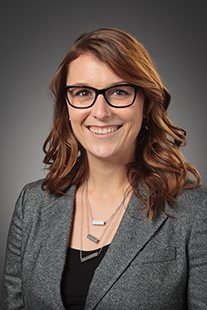 Dr. Rebecca Sametz, who earned two advanced degrees from WMU, completed her doctorate at Michigan State University in 2017 and has accepted an assistant professorship at University of Texas Tech Health Sciences Center in Lubbock, Texas. Sametz received an M.A. in both vision rehabilitation therapy and rehabilitation counseling and teaching in 2014. She will teach graduate-level courses and provide clinical supervision for students in the clinical rehabilitation counseling program. Her work includes teaching, research, advising graduate students, and developing curriculum. UTTHS serves students and their clients who live in the mostly rural areas of Texas, so Sametz will primarily teach online courses. Her dissertation, Development of a Work-Based Learning Model for Youth with Disabilities from the Perspective of Employers, addresses rehabilitation models to assist disabled youth in becoming productive workers and helps health care professionals and vocational rehabilitation counselors serve their clients. While at WMU, Sametz served as vice-chair of the Graduate Student Advisory Committee, now Graduate Student Association, from 2012 to 2014. This role led to increased engagement with the National Association of Graduate-Professional Students (NAGPS) where she was elected to a board position in January 2014. As director of relations, she promoted the organization by communicating with other student organizations about fundraising sources and techniques. 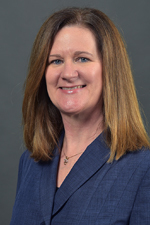 Throughout her career Sametz has been elected to positions in numerous professional organizations, including the Michigan Rehabilitation Association, National Rehabilitation Association, Michigan Job Placement and Development Division, Michigan Rehabilitation Counselors and Educators, and National Rehabilitation Association Job Placement and Development Division (NRAJPDD), of which she was elected president for the 2017 term. As newly elected president of the National Association of Graduate-Professional School Students (NAGPS), Damon Chambers begins his term in a climate of uncertainty for higher education. NAGPS was formed in 1987 to fight efforts by Congress to tax graduate student stipends. New threats have emerged to graduate student funding and NAGPS is still the only student-run national non-profit organization representing graduate and professional students at the local, state, and national level. In November, student leaders from across the country gathered at the 2017 NAGPS National Conference at Syracuse University. During discussions and workshops members focused on how the current political climate will affect graduate funding, interest rates for student loans, and student visas. They also voted on the 2018 governing body. Chambers’ platform was inspired by Western Michigan University’s Three Pillars; he campaigned for an advocacy-centered, leadership-engaged, research-driven, financially secure, and multi-culturally aware organization. Chambers has been an active NAGPS leader as 2015 director of outreach and 2017 director of finance and chief financial officer. 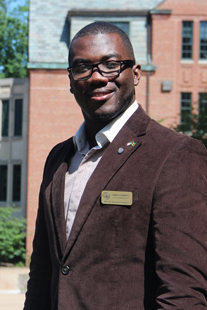 He was instrumental in bringing the 2013 national conference to WMU and has encouraged WMU Graduate Student Association executive board members to serve in leadership positions with NAGPS. He received a Masters of Art degree in blindness and low vision studies in 2014 and an MA in school counseling in 2015. He is expected to receive his doctorate in counselor education at WMU in 2019. In addition to serving as president of GSA from 2013 to 2016, Chambers currently holds the position of director of advocacy and legislative affairs for 2017-18. In November, several second year Master of Science students in the Department of Geography shared their research interests and career plans with the Graduate College. Graduate students can choose one of three concentrations: community development and planning; environmental and resource analysis, and geographic information science. Many students choose to combine these concentrations for an interdisciplinary approach. Students in the program have widely divergent career goals but they have one thing in common: geo-spatial imaging has given them the tools to work in almost any field they choose. Geo-spatial imaging is the science of analyzing imagery from high and low-tech sources, including satellites, remotely piloted vehicles (drones), photographs, and maps, to examine issues such as water quality, health disparities, transportation decisions and business initiatives. Trenton Benedict wants to avoid a desk job and get out in the field. He found a program in environmental and resource analysis where he can literally get out into the field. His research takes him to Saginaw farm fields, where he uses high technology spectral imaging to track the life cycle of Phragmites, an invasive grass species. Phragmites threatens native cattail species, so Benedict’s research focuses on identifying the best time for eradication by disrupting the reproductive cycle of the weed. WMU graduate students are using Geographic Information Systems (GIS) imaging and analysis to prepare for research and teaching careers once they have completed a doctoral program. 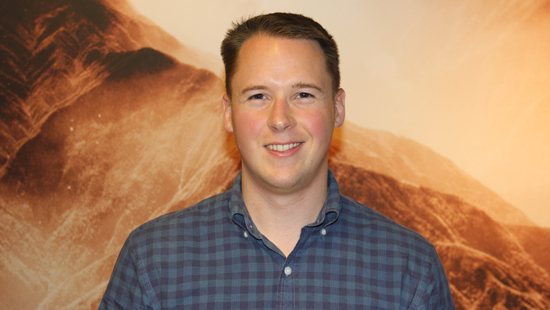 Sam Roodbar’s GIS and human geography specialization led him to research the persistence of locally owned and operated food markets in Dearborn, Michigan. He found that even while global retailers such as Walmart and Costco moved in nearby, small grocery stores stayed in business because they catered to their mostly Muslim customers’ need for halal food. Roodbar won Council Award for Outstanding Graduate Student Paper award at the Association of American Geographers East Lakes Division Conference on October 13. He also recently placed second in the Three Minute Thesis competition at WMU, co-sponsored by the Graduate College and the Graduate Student Association. Alyson Mabie, whose degree concentration is community development and planning, also has her sights on a Ph.D. so she can obtain a university teaching and research position. One of her research project analyzes how the 2013 designation of “Beer City, USA” expanded the cultural boundaries of Grand Rapids, Michigan. She used mapping and GIS to analyze how breweries outside the central city were affected by the designation. Mabie won the Best Graduate Level Presentation at the Association of American Geographers East Lakes Division Conference. Before she graduates in Spring 2018 she will complete a master’s thesis using GIS to analyze the geospatial distribution of graffiti within the city. 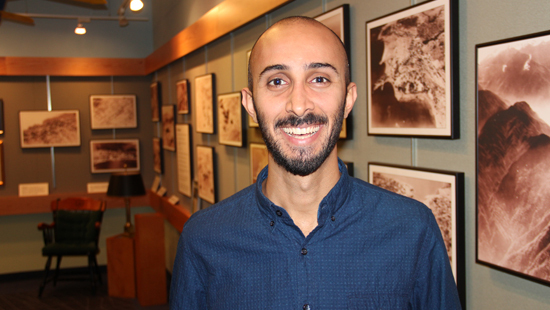 Many students will focus on city or county government planning, like Alex LaPorte, whose concentration is environmental resource and analysis and GIS. Alex is a member of the Kalamazoo County Transportation Authority, a nine-member Board that works to plan, promote, finance and operate public transportation in Kalamazoo County. 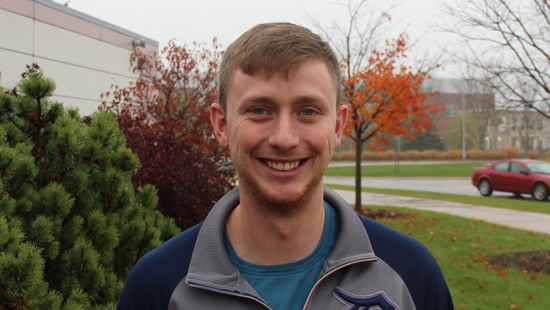 He plans to work with the state in transportation planning and has focused his research on car-deer collisions in Kalamazoo County. By examining the data on how these collisions correlate with location, land cover, land use, weather, road and traffic information, he is working on reducing car-deer crashes. Rowan Cole’s career goals involve international travel. His undergraduate major in Russian Studies and experience as a member of the U.S. Marine Corps, along with his specialties in Geographic Environmental Analysis, human geography, and economic geography have served him as he assesses the effectiveness of Russian environmental policies. 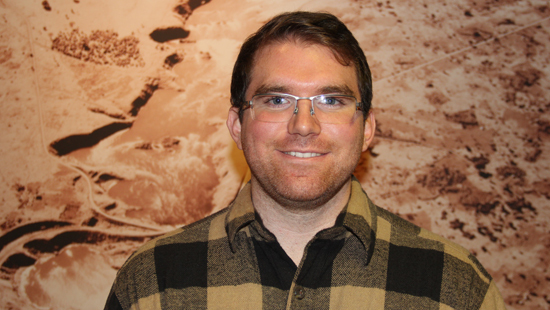 His research looks at changes in deforestation in the Russian Far East through high resolution imagery, then correlates these changes with climate, precipitation and economic data. He then compares his findings with data from a study published in 2000 to see if forest management policies were effective in bringing positive environmental change. 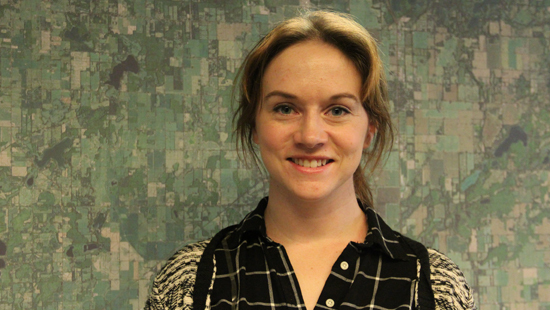 Environmental concerns are foremost for Danielle Molenaar as well; her Environmental Analysis concentration focuses on water use patterns in the City of Kalamazoo over the past ten years. She has used census data for household income and educational levels cross-referenced with weather and climate data to analyze spatial patterns of water use by homes in the city. 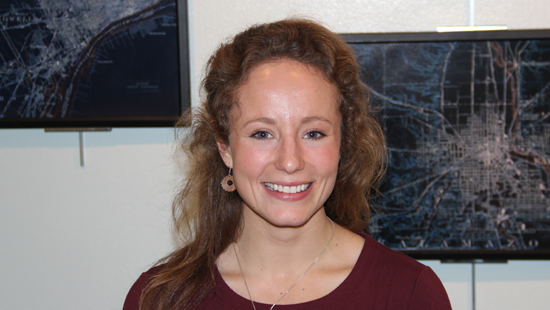 Her expertise in analyzing local water use patterns will help her move into a career in urban water management, flood risk management or local governmental water authority. Students with advanced degrees in geography have excellent employment prospects. Jobs are particularly plentiful in the western United States, where governmental and commercial operations have headquarters and the infrastructure is well-developed. Many obtain private sector employment as consultants. About thirty percent of graduates go on to doctoral programs. Most graduate students in the geography department have the opportunity to work as teaching assistants because the department houses so many undergraduate level courses. Majors in aviation, anthropology, biological sciences, chemistry, economics, history, political science, public administration, health sciences, engineering, statistics, and business, among others, find that knowledge of GIS gives them a definite edge on the job market. Business is booming and Western Michigan University’s Department of Geography is meeting the needs of today’s graduates and their employers.